The Vauxhall International North West 200 paddock will be the place to be for two very special events during the Race Week festival. No-one will want to miss the one-off ‘Evening with John McGuinness’ in the main marquee on Wednesday, kicking off at 7.30pm, when the 21-times Isle of Man TT winner will give the inside story on his brilliant racing career. McGuinness, who has won six times at the North West 200, will give an illustrated talk, discussing everything from how he got started in the sport to being Joey Dunlop’s final team-mate in 2000 and becoming the second most successful TT racer of all time. Now in his 25th season of racing, there is no rider who has achieved so much between the hedges and the Morecambe man will tell the real story behind the tales of that success. McGuinness remains with the factory Honda Racing team this season with Manx rider Conor Cummins as his team-mate on the CBR1000RR Fireblade SP Superbike. He will also contest the Supersport class alongside Cummins on a Honda for Jackson Racing and run his own Superstock Honda machine. McGuinness saw his hopes of landing more silverware last season thwarted after he sustained a wrist injury but he is now back to full fitness. Meanwhile, on Friday evening in the marquee it will be the turn of Steve Parrish and his unique ‘Question of Bikes’ event. Starting at 8pm, the former Grand Prix racer turned television presenter will host a special quiz night involving two teams of top riders who will be questioned on their bike racing knowledge. An irreverent take on the BBC’s Question of Sport, the special event is sure to be a fantastic night of fun entertainment. Both events will be followed by music in the marquee. 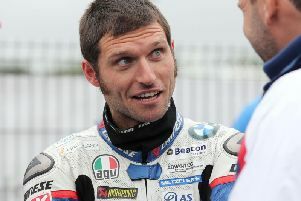 Tickets available via the official North West 200 website at www.vauxhallnorthwest200.co.uk.